Bicyclists who are cautious when traveling next to speeding cars may not realize the dangers of being hit while standing still. A biker who is waiting for her turn at a stop sign may be struck without warning, forcing her off the road—or into oncoming traffic. Our attorneys take a look at the most common ways these accidents occur, helping bicyclists identify who could be at fault for a crash. The majority of bicycle accident injuries are caused by cars. However, that does not mean that the driver is the only person that can be held liable for the cost of a biker’s injury. 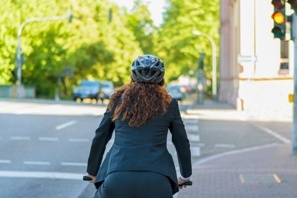 Many different parties can be liable for a bike accident at a stop sign, including the cyclist himself, and it may take some careful investigation to determine who can be held responsible for negligence. Driver runs stop sign. A driver who runs a stop sign places all road users at risk, but pedestrians and bikers are most vulnerable to severe injury. A bicyclist with the right-of-way may be struck on his side by a driver who fails to stop at an intersection, causing broken bones or head injuries to the unprotected cyclist. Driver swerves into biker’s path. Drivers who are unwilling to share the road may attempt to pass a cyclist when the two vehicles come to a stop. An angry driver may swerve into the biker’s path after overtaking him, “crowding out” the cyclist and forcing him off the road or into the back of the car. Driver turns in front of biker. Cyclists suffer t-bone collisions when drivers turn left across an intersection without checking the crosswalk, but they may also be struck when traveling next to a car that makes a sudden right turn across their path. Driver fails to see bicyclist. Drivers who strike cyclists on city streets may claim that they simply didn’t “see” a biker. However, a failure to notice a cyclist can be a form of negligence, since drivers are required to look for all kinds of vehicles on the roadway. Driver hits biker’s back wheel. A driver who is distracted, tailgating a biker, or driving aggressively may not have room to stop safely when approaching an intersection. These car-bike collisions commonly involve a driver striking a bike’s rear wheel, throwing the cyclist into the air or backward onto the hood of the car. Bicyclist is trapped in an intersection. A bicyclist does not have the ability to accelerate as quickly as a car, and may take several seconds to clear a busy intersection. If vehicles at a four-way stop don’t pay careful attention to who has the right-of-way, the cyclist may be trapped between oncoming vehicles. Biker runs stop sign. It takes a lot of momentum to power a bicycle, and cyclists may attempt to avoid stopping if they don’t see any cross traffic in an intersection. Cyclists may even collide with other cyclists in a four-way stop, especially if their view of the road was obstructed by buildings, hills, or landscaping defects. It is important to remember that cyclists can still file an injury lawsuit if they are partially to blame for an accident. In Tennessee, a victim who is less than 50% responsible for an injury is entitled to recover damages. However, the damages the victim receives will be reduced by his or her percentage of fault. The more losses a cyclist sustains, the more the percentage of blame becomes a crucial factor in his recovery. At GriffithLaw, we have seen firsthand the harm that bike-car collisions can cause. In order to ensure that injury victims can get their questions answered, we provide injury consultations at no cost. We also work on a contingency-fee basis, so our legal fees are paid with a portion of the settlement we secure for you. To learn more about your rights, simply fill out the short contact form on this page or request a free copy of our book, The 10 Worst Mistakes You Can Make With Your Tennessee Injury Case.